Live hot-air welding and unique offsite roofing solutions drew specifiers and contractors to the IKO Polymeric stand at the Build Show, held in the NEC in October. 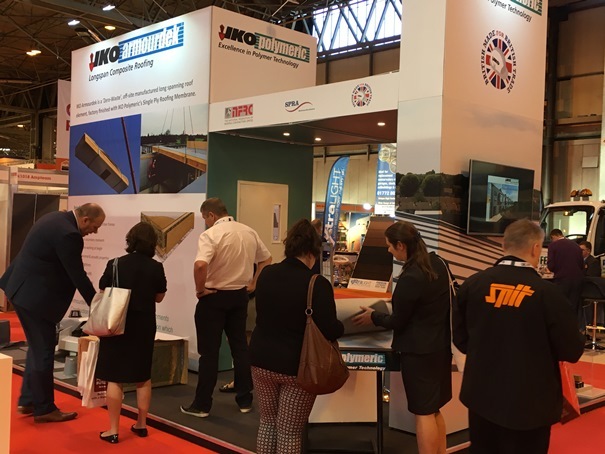 IKO Polymeric’s Armourplan PVC and Spectraplan single ply roofing membranes were on show alongside its new IKO Armourdek pre-fabricated roof panel. “As well as its environmentally friendly features, Spectraplan is a unique product offering some remarkable benefits to roofing contractors,” explains Buket Aydinlik, IKO Polymeric Marketing Manager. Welding live on the stand, IKO Polymeric’s experienced field engineers demonstrated how punctures can be repaired without a patch and problem creases easily fixed. Spectraplan can also be welded at lower temperatures for perfect detailing on corners and upstands. Visit www.ikopolymeric.com or @ikopolymeric for further information about the roofing solutions available from IKO Polymeric.